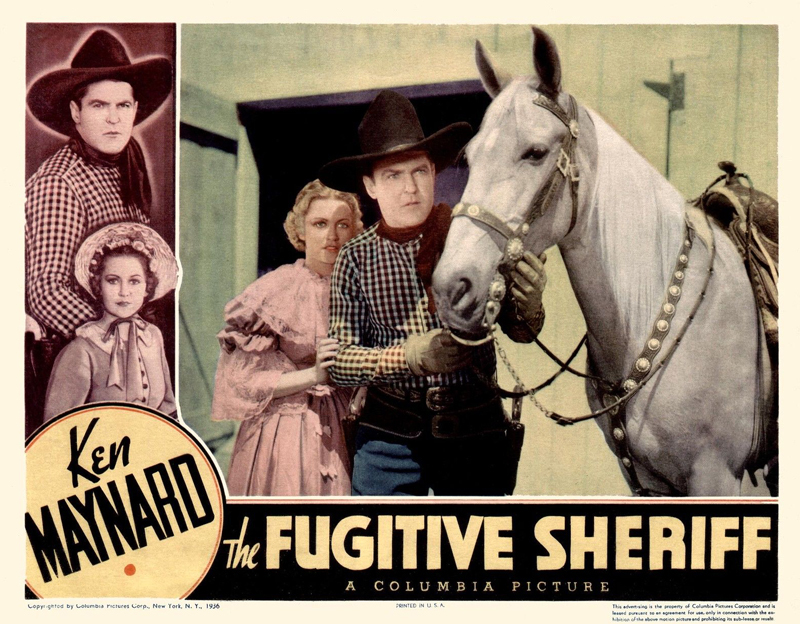 Ken Maynard, Beth Marion and Tarzan star in "The Fugitive Sheriff" (Columbia 1936) — although in this instance, Tarzan didn't receive a screen credit. Tom Mix had Tony. Roy had Trigger. Gene had Champion. (Actually a few Champions.) Ken Maynard had Tarzan, The Wonder Horse — and by most accounts, Tarzan ranked right up there with Tony as one of the greatest trick ponies that ever loped across the silver screen. Maynard bought Tarzan in Newhall around 1925. First, a word about Maynard. 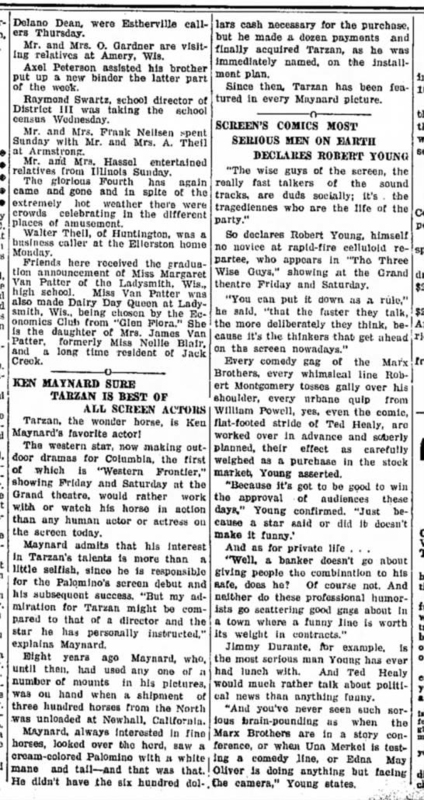 One of the earlier Hollywood cowboy superstars, Maynard (July 21, 1895 — March 23, 1973) was adored by fans and vilified by coworkers (mostly for his ego and for an off-screen drinking problem that belied his wholesome on-screen persona. What the audience doesn't know, right?) Born in Vevay, Ind. (not Texas as per the studio publicity), he left home at 16 to join the circus. He performed with several shows including Pawnee Bill's, and he rodeoed in 1920 at Pendleton. Ringling Brothers signed him in 1921. In 1923, Mix helped him get a part in a Fox film ("The Man Who Won"), and from there, Maynard was off and running. Ken's younger brother Kermit (his birth name) also came to Hollywood and became a successful movie stuntman. In the 1960s and 1970s, film historian Jon Tuska interviewed many Western producers, directors, studio bosses, cast and crew members of the 1920s and '30s, including Ken Maynard. At the time, Maynard was on his last legs, living at the bottom of a bottle in North Hollywood. "While still with Ringling Brothers," Tuska writes in his 1982 book, The Vanishing Legion: A History of Mascot Pictures 1927-1935, "newspapers had carried stories of the death of Mazie, one of the performing horses Maynard had used. Photographs had been published of him with Brownie, a mare he had traveled twenty thousand miles with. But it was at Newhall, California, that Ken bought a golden three-year-old palomino for fifty dollars. He named him Tarzan, after Edgar Rice Burroughs' jungle hero. "Tarzan began appearing with Maynard in the Davis Westerns," Tuska writes. Davis Distribution Division was a small, independent production house that had cast Maynard in 1924's "$50,000 Reward," which was filmed on location at the Hollywood (aka Mulholland) Dam — the twin of the St. Francis. But we digress. Tuska writes that next, "in 1925, Maynard was signed to do a non-Western called 'North Star'..."
The year 1925 is consistent with information on IMDB, but the online source is regrettably anonymous. It, too, gives the $50 figure and says Burroughs sued Maynard over the name. "Ken settled out of court on the condition that his stallion be called 'Tarzan, The Wonder Horse,'" it says — not simply "Tarzan." (Apparently Mix must not have minded that Tony had the nickname "Wonder Horse" first.) IMDB describes Tarzan as half-Arabian, half-American saddle horse. But again, the source of this information is anonymous. What's not anonymous is an article published July 8, 1936, in the Estherville (Iowa) Enterprise. It indicates a different date and purchase price: "Eight years ago [which would be 1928] Maynard, who, until then, had used any one of a number of mounts in his pictures, was on hand when a shipment of three hundred horses from the North was unloaded at Newhall, California. "Maynard, always interested in fine horses, looked over the herd, saw a cream-colored Palomino with a white mane and tail — and that was that. He didn't have the six hundred dollars cash necessary for the purchase, but he made a dozen payments and finally acquired Tarzan, as he was immediately named, on the installment plan." So $50 isn't exactly wrong, if this account is correct — but it was $50 per installment, 12 times. As for the year, 1925 seems preferable. According to IMDB, Tarzan was first credited in 1925's "The Demon Rider," followed by "Senor Daredevil" in 1926. Then, from 1927's "Somewhere in Sonora" onward, Tarzan worked alongside Maynard regularly in both film and circus until Tarzan's death in 1940. Another article from The Times (San Mateo, Calif.) of Jan. 2, 1937, adds some detail about the purchase: "Ken picked Tarzan out of an odd lot of stock horses that were being auctioned off in a shipping corral at Newhall, California, and the two founded a picture-making partnership that has endured many years." "(Maynard's) trick horse, 'Tarzan,' is insured for thousands of dollars. He was bought from a school teacher, who lived at Newhall. Maynard trained the horse for silent pictures, and then had to re-train him for sound, so that all the instructions are given the horse by the movements of the hands." 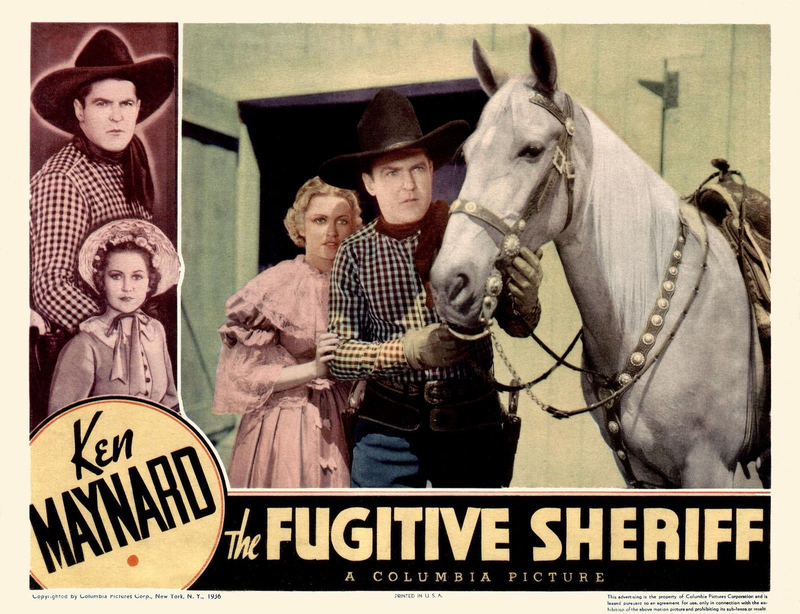 "One day, shortly after signing the contract with Charles R. Rogers, producer, for the series of First National pictures, of which 'Senor Daredevil' is the first, Maynard was looking over a band of horses closely bunched in a corral at Newhall, about 30 miles from Hollywood. "Suddenly a movement of the animals revealed the horse! After careful appraisal at a distance Maynard interviewed the Mexican driven [sic] to whom the horses belonged. Without seeming too interested, Maynard made what he felt was a liberal offer, thinking it might be snapped up, but his eyes must have betrayed his desire for the beautiful animal, for after considerable bargaining, and the lapse of several days, he had to pay $200 more than his original offer! "After acquiring Tarzan Maynard had a very emotional letter from a lady in San Francisco, who it seemed was Tarzan's former owner, and had only parted with him through pressure of reduced circumstances. She bespoke for her former pet the kindest treatment and asked the new owner to send a photograph — of the horse! It was promptly mailed to her." Like any movie horse, Tarzan had stunt doubles. 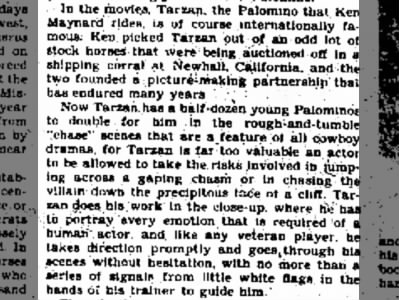 Per the 1937 San Mateo Times article: "Now Tarzan has a half-dozen young Palominos to double for him in the rough-and-tumble 'chase' scenes that are a feature of all cowboy dramas, for Tarzan is far too valuable an actor to be allowed to take the risks involved in jumping across a gaping chasm or in chasing the villain down the precipitous face of a cliff. Tarzan does his work in the close-up, where he has to portray every emotion that is required of a human actor, and, like any veteran player, he takes direction promptly and goes through his scenes without hesitation, with no more than a series of signals from little white flags in the hands of his trainer to guide him." Tuska, the film historian, gives Tarzan more credit. Tarzan wasn't just a pretty face. "Among movie cowboys' horses," Tuska writes, "Tarzan may have been the most exceptional. Unlike Roy Rogers' Trigger, billed as the smartest, and Gene Autry's Champion, billed as a world wonder, Tarzan was not entirely the creation of studio publicity. His only real rival would be Tony, but Tony's supremacy was confined to his ability to direct horse action and to behave with almost human intelligence, and in this Tarzan equaled him in Maynard's films like 'Come On, Tarzan' (Worldwide, 1932). Readily trained by means of one-syllable instructions, Tarzan was Maynard's costar in virtually every film. Scenes were constantly written into Ken's pictures calling for the horse to dance, to bow down, to roll over and play dead, to nod his head in response to questions, to ring a fire bell, to pull Ken from a turbulent river, to chase desperadoes by himself, to untie Ken, to jump from great heights or great distances, to plunge into burning buildings, to drag Ken hanging onto his tail on land or in the water, to rock a baby crib, or to cook a meal, as well as providing the reluctant hero with a push into the willing heroine's arms." Tuska acknowledges the doubles: "While at First National, Maynard assembled an entire string of palomino horses to support Tarzan, one of which would buck or rear, one of which would run up to a certain mark and stop cold, one for pulling and tugging at objects like jail bars, but viewers always looked for the identifying black birthmark on Tarzan's rear flank and thereby could tell whether it was the original or a double." While the story of Tarzan leaves us with a few things to "wonder" about, in a certain aspect all sources agree: One of the most popular Western duos of early filmdom first came together in Newhall.